My wife, Laura, and I have started a new weblog: Starling Fitness will focus on fitness, diet, and health topics. Laura does most of the writing. The site has been online nearly a week and already has lots of content. The site runs WordPress using a custom template I designed. It’s my first experience creating a fully CSS-based layout (no tables!) and it seems to work pretty well. I’ll be refining the design and fixing a few details here and there, but I’m happy with how it turned out. I used the Faux Columns technique to make the columns equal length and add some minor flourishes to the column borders. Check it out and let me know what you think, or any browser errors you encounter. 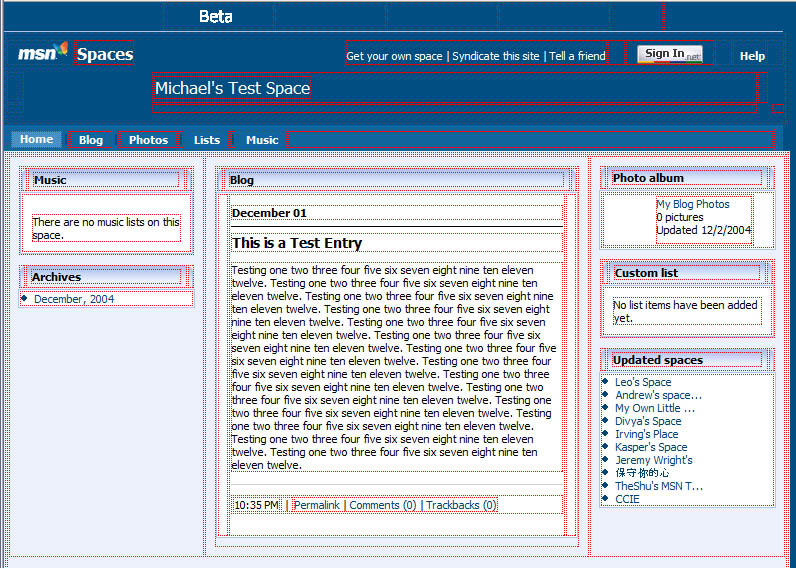 Now I just need to do a proper CSS layout for some of my other sites—this one for example. 2004 has been an especially rich year for new techno-jargon. So, in the spirit of full disclosure, here’s a guide to some of the terms that made it big this year. While the list includes such obvious memes as “phish”, “offshored”, and “podcasting”, some are a bit more obscure. The word “gatesed” (meaning affected negatively by microsoft) only appears a few times in Google, the word “mouselexia” appears only once, and the word “netlag” means something else to us geeks. But it’s fun nonetheless. If this new feature goes out of beta, I expect some serious competition for some of the letters, and a whole new kind of misspelling-based spam. Proof that I’m getting old: as of sometime last month, The Quotations Page has been online for 10 years. I put the first primitive version of the site online in 1994. Thanks to Google News, here’s the quotes of the day announcement from November 22, 1994 and the search engine announcement from November 25. The Internet Archive doesn’t go back to 1994, but here’s what the site looked like in 1997 and 2000. It’s bizarre to imagine the Web when I started this site. Yahoo started about the same time as my site. Google wouldn’t appear until 1998. Nobody worried about PageRank back then, but I was quite pleased to be listed in the Internet Scout Report. Netscape 1.0 was released in December 1994, and Internet Explorer would first appear in 1995. The site has grown quite popular since then, and what was once a simple hobby site is now a full-time job. It currently has a database of over 21,000 quotations and over 30,000 unique URLs, making the word “page” in the name sound increasingly silly. In 1996, the site had about 3000 page views per month. Last month, there were 11 million page views and nearly two million unique visitors. I started the site on a personal account that came with my Internet access. In 1996 it moved to its own domain name on a shared hosting account. In 2001 it moved to a dedicated server and in 2003 I added a second server. It’s now keeping two 2 GHz Pentium 4 servers busy, along with my other sites. I launched a slightly-redesigned version of the site today, with a more modern color scheme and yet more fixes to the ancient code. (Most of the pages even validate!) Next on the agenda: a much better search engine. I couldn’t have lasted this long without lots of loyal visitors, my wife Laura (who compiled the motivational quotations), the regulars at the forum, and other contributors. Thanks everyone, and here’s to 10 more years! A good read: Eric Meyer talks about how Microsoft can support standards without breaking the web. Meanwhile, MSN just launched their weblog service, MSN spaces, today. You can stop making fun of LiveJournal now—there’s a new place for newbies. And while I’m taking cheap shots, I’ll mention that the design of this new site shows Microsoft’s usual attitude toward standards. Here’s a sample weblog and here’s a screenshot of the same with all of the table cells outlined and here is the list of over 200 validation errors.